Edogawa River flows on the boundary between Tokyo and Chiba. The river has the source in Tongegawa River, and it was called Futoigawa River by Sengoku Period and Tonegawa River by Edo period. In early Edo period, since Ieyasu Tokugawa moved Tonegawa River to east, Edogawa River was crowded by thousands of ships for water transport from northern provinces and north Kanto region to Edo. The table land called Konodai is on the eastern edge of Shimousa Plateau, there was the provincial capital of Shimousa in Classic. And there were the remains of Konodaijo Castle built by Dokan Ota broken down by Ieyasu Tokubawa in Satomi Park. In Sengoku Period, the Battle of Konodai were the one of the fiercest battles to gain the power to control Kanto region broke out twice in the area around Konodai and Edogawa River, there are several remains related to the loser of the battles, Satomi Clan in both side of the river such as Edogawa-ku and Ichikawashi. You can see both Mt. Fuji and Tokyo Skytree in simultaneously from the bank of Edogawa river. Especially, you can see the Mt. 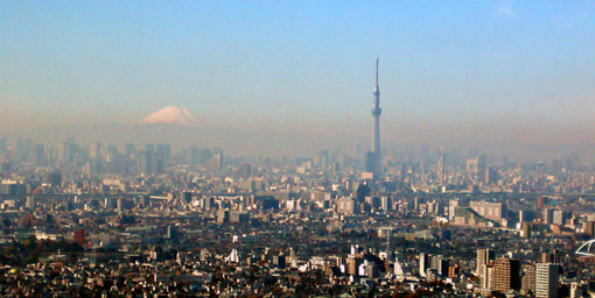 Fuji dramatically standing behind Tokyo Skytree, Tokyo Tower and skyscrapers in Tokyo from the observatory on I-link Town Ichikawa in the south gate of Ichikawa Station is more beautiful. In addition, there is the over 600- year-old pine tree called Yogo no Matsu (Buddha disguise of a pine tree) designated as the national natural treasure in popular temple Zenyoji called Koiwa Fudo. A walk on Edogawa River and Konodai on the historical battlefields is the course having many scenic beauties could feel nature beside you. Why don't you visit areas along Edogawa River and near Konodai?